How do Houston firefighters train for real-life crisis situations? Step inside HFD's training academy. HOUSTON (KTRK) -- At first glance, they appear to be historic railroad trains -- but step inside these cool locomotives on any given day and you will find HFD's brave first responders training on how to keep us all safe during emergencies. The trains on display at the Houston Fire Department Academy have been refurbished and transformed into modern classrooms, equipped with desks, chairs, air conditioning, ceiling fans, hardwood floors and projection monitors. "The best part is that 95% of the materials have been donated to us by people and commercial companies in the community," said Kevin Okonski with HFD's Hazmat Team. "My team not only learns the safest way to handle train derailments, pipeline or truck emergencies in the classroom, but we also experience it on site with real life demonstrations." MORE COOL SPACES: Is this Houston's coolest office? With Houston being the Petrochemical Capital of the World, Houston's Fire Department Hazardous Materials Response Team has become a leader in training best safety practices to HAZMAT teams across the globe. "It's what can we do here in Houston to not only help our city and surrounding agencies, but also help teams worldwide" Okonski added. Round Top's stunning 24-acre "Glass House" has three levels of ceiling -to-floor glass windows, with breath-taking views. 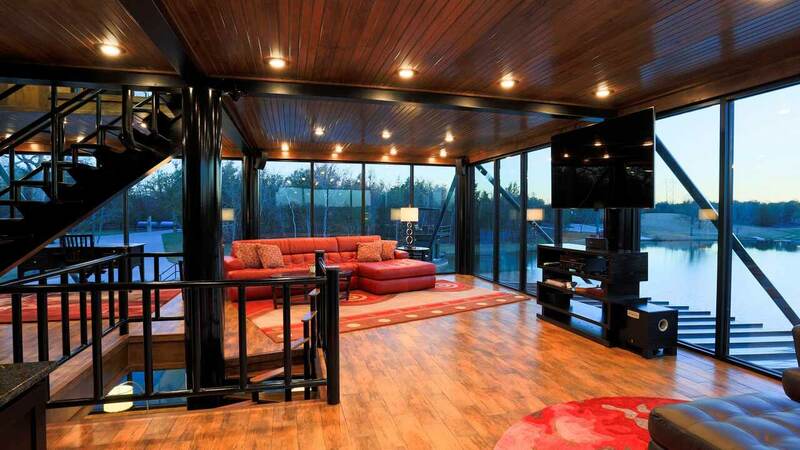 The luxury vacation home sits on a private lake, and is only accessible by boat or bridge.